Rush toward death and life will be given to you"
"Allahu Akbar! Cursed is anyone who doesn't sacrifice for Jerusalem!" 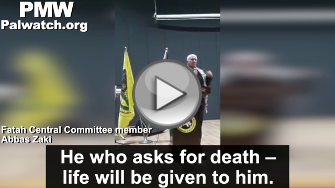 "He who asks for death - life will be given to him"
"Millions of Martyrs are marching toward Jerusalem"
"Those who die [naturally] are the cowards"
Mahmoud Abbas' deputy chairman in Fatah calls released murderer and all imprisoned Palestinian terrorists: "A laurel wreath on the forehead of the homeland"
"Allahu Akbar! Allahu Akbar! Cursed is anyone who doesn't sacrifice for Jerusalem!" "What did [Arafat] say? He said: 'Rise! The gates of Paradise have opened.' He who asks for death - life will be given to him. Those who die [naturally] are the cowards. But real men approach death with a smile. Do not be afraid - death is in the hands of Allah. Rush toward death and life will be given to you!" 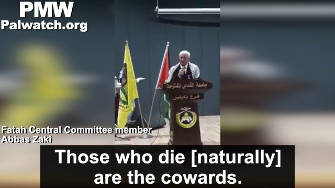 This is a prime example of how the PA and Fatah poison the minds of Palestinian children and youth, teaching them to aspire to die for Jerusalem, the Al-Aqsa Mosque, and "Palestine." 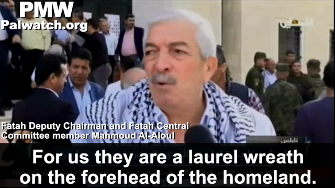 For two decades, Palestinian Media Watch has documented these messages from the Palestinian leadership to the Palestinian people. Zaki's inciting speech shows that encouraging the young generation to seek death for "Palestine" is not merely a historical artifact from the period of the PA terror campaign (the second Intifada, 2000-2005), but rather an integral part of the Palestinian narrative, culture, and society today - and worse yet: an integral part of PA policy. 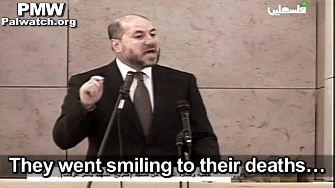 - Jerusalem is in danger and needs Palestinians to defend it - or more specifically, "sacrifice for it"
- Those who willingly ("with a smile") die for this ideal become "Martyrs," go to "Paradise," and are rewarded there by Allah with eternal "life"
- Those who refrain from heeding this call and do not actively seek death are "cursed" and "cowards"
PMW has exposed that the PA leadership communicates these messages to Palestinians using all the communication platforms at its disposal, be it public events, TV broadcasts, written media and social media, or even schoolbooks. 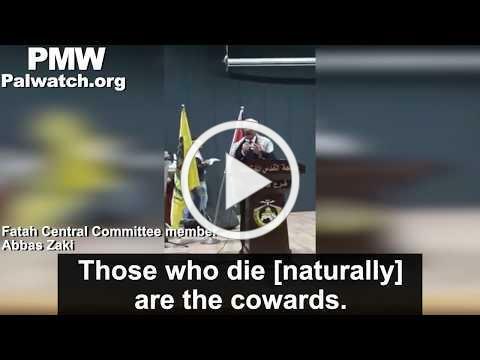 "Those who die [naturally] are the cowards. But real men approach death with a smile." 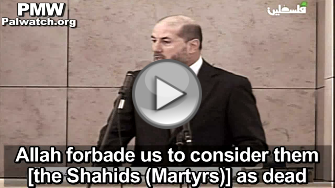 The PA and Fatah glorify and promote "Martyrdom-death" (Shahada) for Allah as a supreme ideal. Those who are killed while carrying out terror attacks or "struggle against the occupation" are honored as "Martyrs" and rewarded by Allah in the afterlife. They go to Paradise where they marry 72 virgins. 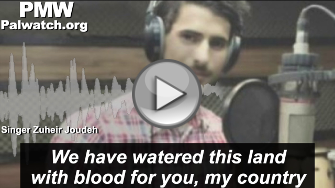 Official PA TV has broadcast a music video that urges Palestinians to heed the "call of Al-Aqsa" and become "grooms and brides" who enter "the Paradise of immortals." Allah forbade us to consider them [the Shahids (Martyrs)] as dead or to speak of them as being dead... They went smiling to their deaths... The Shahid has merit with Allah, a merit that no one else has..."
Zaki: "When [Muhannad] Halabi (i.e., terrorist, murdered 2) went out with a knife in spite of everyone, and they [Palestinians] began carrying out - may Allah grant them success - the Jerusalem operations (i.e., terror wave), they [Israelis] began to put cement blocks [at bus stops] to protect themselves." 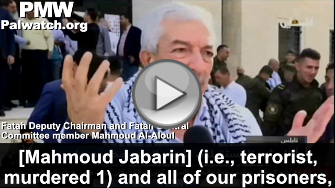 Fatah Deputy Chairman and Fatah Central Committee member Mahmoud Al-Aloul: "[Mahmoud Jabarin] (i.e., terrorist, murdered 1) and all of our prisoners, we are very proud of them. For us they are a laurel wreath on the forehead of the homeland. 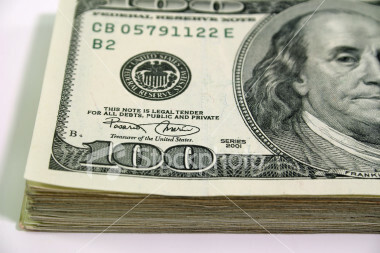 Greetings to them, and we say to them that they live in our hearts, in our minds, and in our conscience." We are men who do not fear death"
"Ask for death and the life will be given to you"
And then either a life that will gladden friends, or a death that will enrage the enemies. By your life! This is the death of men. 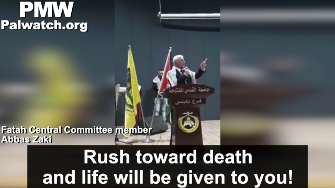 And who asks for a noble death - here it is..."
Posted text: "Fatah Central Committee member [and Fatah Commissioner for Arab and China Relations] brother Abbas Zaki's speech during the reception for the new students, the Yasser Arafat class, in the Nablus branch of Al-Quds Open University." 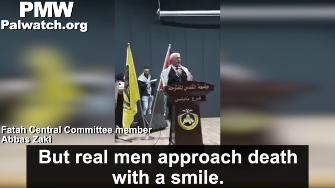 Fatah Central Committee member Abbas Zaki: "Jerusalem is the jewel in the crown. Yasser Arafat knew the value of Jerusalem and repeatedly said: 'Millions of Martyrs (Shahids) are marching toward Jerusalem." Abbas Zaki chants and the audience repeats: "Millions of Martyrs are marching toward Jerusalem." Abbas Zaki: "Allahu Akbar! Allahu Akbar! Cursed is anyone who doesn't sacrifice for Jerusalem! This is Yasser Arafat - that Jerusalem will be the jewel in the crown. And when Yasser Arafat was in Lebanon... What did [Arafat] say? He said: 'Rise! The gates of Paradise have opened.' He who asks for death - life will be given to him. Those who die [naturally] are the cowards. But real men approach death with a smile. Do not be afraid - death is in the hands of Allah. Rush toward death and life will be given to you! Today I wish to tell the Israelis who compete with each other in order to slaughter us... the following message: If you [think that you] have bypassed the [Palestinian] leadership - no! This great people will bring about the victory and the miracle will occur! Who is Israel? Who is Israel when we are united? There can be no agents or sellers of land [to Jews/Israelis] among us." Yasser Arafat - Founder of Fatah, former chairman of the PA. During the 1960s, 70s and 80s Arafat was behind numerous terror attacks against Israelis. Although he received the Nobel Peace Prize in 1994 together with then Israeli Prime Minister Yitzhak Rabin and then Israeli Minister of Foreign Affairs Shimon Peres "for their efforts to create peace in the Middle East" after signing the Oslo Accords peace agreement, Arafat launched a 5-year terror campaign - the second Intifada (2000-2005) - in which more than 1,000 Israelis were murdered. Arafat died of an illness in 2004. Muhannad Halabi - 19-year-old Palestinian terrorist who murdered 2 Israelis, Rabbi Nehemiah Lavi and Aharon Bennett, and injured Bennett's wife, Adele, and their 2-year-old son in a stabbing attack in the Old City of Jerusalem on Oct. 3, 2015. 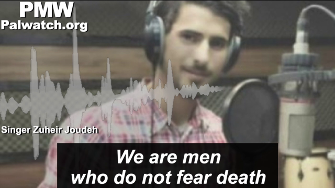 Following the attack, he was killed by Israeli police. Prior to his attack, the terrorist wrote on Facebook about recent Palestinian violence and terror attacks in response to Jews visiting the Temple Mount - and stated that it was a response to Israel's actions at the Al-Aqsa Mosque." This is a reference to the PA libel that Israel is plotting to take over and destroy the Al-Aqsa Mosque and to the PA's portrayal of Jews praying on the Temple Mount as "an invasion of the Al-Aqsa Mosque." Palestinian terror wave (2015-2016) - Palestinian violence and terror attacks against Israelis, including stabbings, shootings, throwing Molotov cocktails, and car rammings. It started in September 2015 and as of July 2016, 40 people were murdered (36 Israelis, 1 Palestinian, 2 Americans, and 1 foreign worker from Eritrea) and over 500 wounded. Mahmoud Jabarin - Israeli Arab terrorist who murdered Palestinian Ahmed Ja'aroura who he suspected of collaborating with Israel, in October 1988. Jabarin served a 30-year prison sentence and was released in October 2018.